KotOR fans rejoice – as long as you like novels that is. The Friday update this week isn’t a game update or even a developer blog. This week we get info on the third novel set in the Old Republic time line. Titled Revan, this novel is written by Drew Karpyshyn, Principal Writer at Bioware, and author of the Darth Bane series. 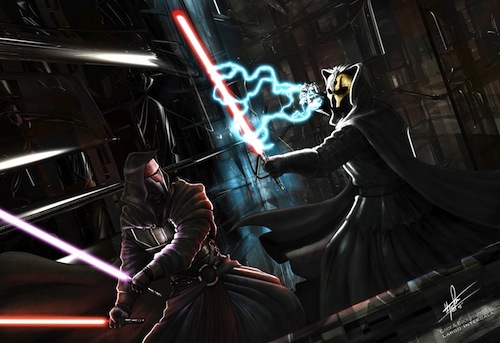 Though Revan is the main protagonist in this novel and will be based off of the Revan who was a Light-sided male Jedi as canon states, it will also reveal who the Sith Emperor is, where he is from, and how he’s held onto power for the length he has. Drew Karpyshyn also does a Q&A over his upcoming novel, I’ll just go through and quote a couple of the more interesting ones. Q: How does it feel to finally reveal that the title of your latest Star Wars book is Revan? Now a lot of people are complaining about not getting game info, but what other game has given us an update every week? No one has. So I’m pretty excited about the book, being a huge Revan fan I’ve always been extremely curious of what happened to the KoTOR hero and this is our chance to learn all about it. 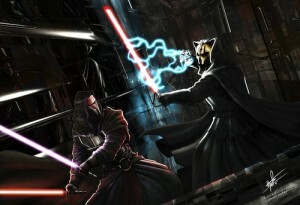 Q: In what ways will readers who have read Revan benefit when playing Star Wars: The Old Republic? A: I think the novel will give them a much better understanding of the Sith Emperor and the Empire, for one thing. The Old Republic Sith Empire is very different from what people know from the movies, or even from the Great Hyperspace War comics that focus on characters like Naga Sadow and Ludo Kressh. The novel will also give them some very direct background and detailed information that ties in directly with key Flashpoints in the game. I can’t say too much, of course, but like any great prequel the books will give you the details of what came before to add an extra layer of depth to the experiences in the game. If your a total lore hound and have to know all there is to know about the game then this novel might be worth buying, or if you’re just a KotOR fanboy, like myself. Q: What other characters from Knights of the Old Republic and Knights of the Old Republic II might we expect to see? A: You can’t tell a story about Revan without also exploring his companions; they were such a key element of the KOTOR experience that it wouldn’t feel right without bringing some of them back. Of course it would be impossible to include all of them in a novel in a way that would make a cohesive and fulfilling story, so I focused on those who felt most directly relevant to what happened to Revan after the KOTOR games. I don’t want to give too much away, but Canderous, T3-M4, the Exile and Bastila Shan all have significant roles to play in the novel (along with some significant characters who appear in Star Wars: The Old Republic). This one really got me excited just because I’ve always wondered about the opening to KoTOR II why the Ebon Hawk was all banged up, barely still flying only being operated by the small, but determined astromech droid T3-M4. I can’t wait for this novel. I haven’t read the other two, Deceived and Fatal Alliance, but I just can’t pass up Drew Karpyshyn’s Revan.